In a field thick with potential winners, it was no surprise that two rose to the top. 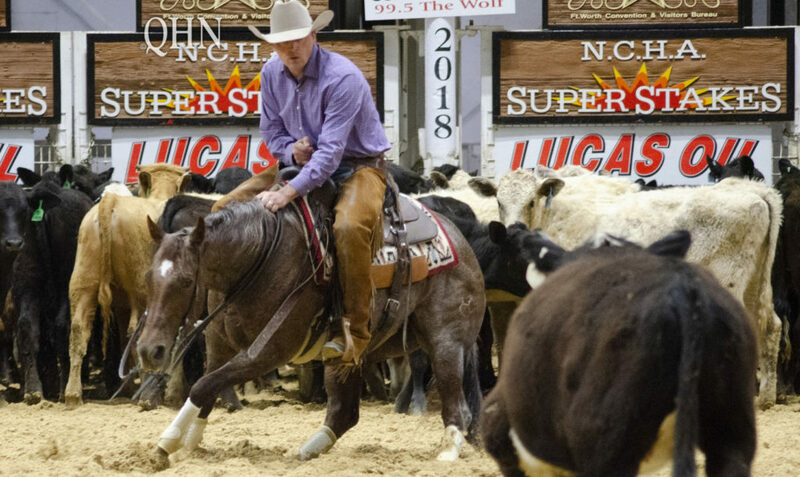 “Cutting with the Stars” would have been an apt description of Sunday night’s Lucas Oil National Cutting Horse Association (NCHA) Super Stakes Non-Pro finals. Among the 21 finalists were 2017 NCHA Futurity Non-Pro Champions Chad Bushaw and Bittersweet, as well as Megan Miller and Carolena Reyn, who won the first go-round, composite and Non-Pro semifinals. Both teams scored a 222 to share in a well-earned victory in Fort Worth, Texas, and take home $36,319 each. Bushaw stepped up first when he rode Bittersweet (out of Miss Sea Rey x Dual Rey) onto the sandy stage of Will Rogers as the eighth to work. With more than $62,000 in earnings to her credit, Bittersweet essentially made her first return to the arena since last December. The dark red roan daughter of Metallic Cat was clearly ready to make her reappearance memorable. Bushaw was quick to thank his business partner, Alana Chalmers, whose support allows him to take the time he needs to compete, as well as Crystal Hensley, who prepares the horse for competition. “She is so devoted and is a special girl. We’re very lucky to have her on the team. The four guys helping me, they’re all close friends and are guys my boys can look up to, good family men. Previous post link Oh, Brother!